Test, measurement & data acquisition. The perfect low cost solution for designers, makers and hobbyists. If you work with embedded systems like Arduino or Raspberry Pi, or if you design, build and debug electronics, robotics, servos or sensors, BitScope is for you. Learning programming and electronics has never been such fun. Teaching it has never been more effective. See what really happens when theory meets practice. Online resources, flexible software and robust hardware for the busiest student labs. Industrial strength test, measurement & data acquistion that's built to last. 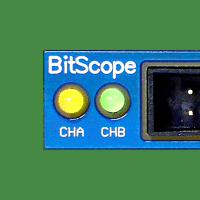 Rack-mount or desktop, networked or USB, fully programmable and infinitely adaptable, BitScope is ideal for automated testing, monitoring & control. 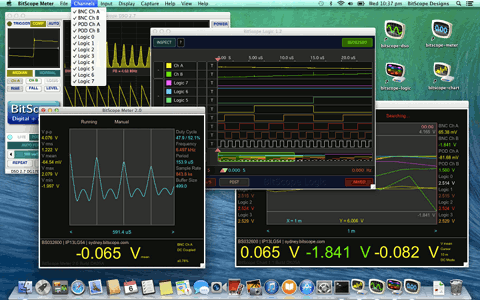 BitScope Mixed Signal Systems are programmable PC based oscilloscopes, logic analyzers, spectrum analyzers, waveform generators and data acquisition systems for Windows, Mac OS X, Linux and Raspberry Pi. They offer comprehensive solutions in test, measurement, monitoring & control for engineers in industry, education, R&D and service. 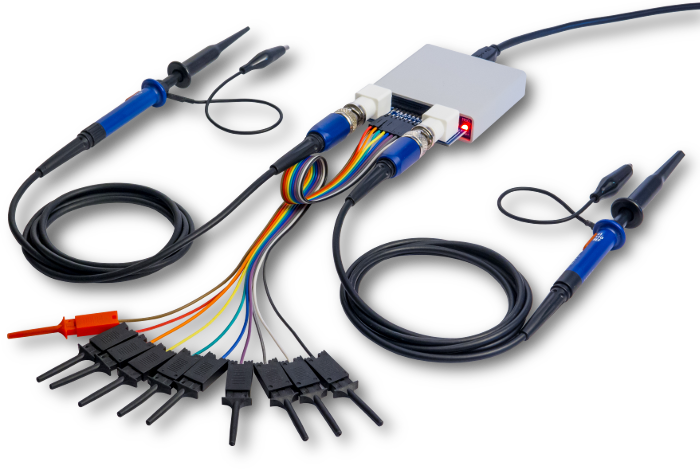 BitScopes are very cost effective and range from the tiny USB powered BitScope Micro to full sized industrial grade and networkable mixed signal oscilloscope solutions. They are all based on the unique and powerful BitScope Virtual Machine which means they can always be upgraded and customized dynamically in software. BitScopes are built to last. Whether it's a network connected rack mount data acquisition system, desktop USB connected test instrument or a portable multi-purpose mixed signal capture system, most BitScopes are housed in a tough aluminium case for robust physical protection and reliable EMI immunity. BitScopes deployed years ago are still in active service and all 23 supported models are compatible with the latest software so you can rely on them 24x7 for years to come. All BitScopes capture digital + analog signals simultaneously. 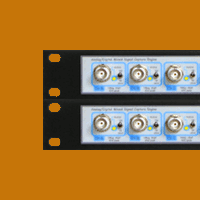 Whether it's a network connected mixed signal scope or the tiny BitScope Micro, each one offers a combined view of analog and digital waveforms. Most models have 100 MHz bandwidth and up to 40 MS/s digital capture. Some include waveform and clock generators, protocol decoders, digital I/O and all can drive low power external circuits. BitScopes are ideal for prototyping, testing and debugging all sorts of real-world mixed signal systems from analog circuitry, digital logic and embedded computing to communications systems, sensors and servos in robotics or industrial process monitoring and control systems. BitScopes are available with a wide range of software for Windows, Mac OS X, Linux and embedded x86 and ARM. 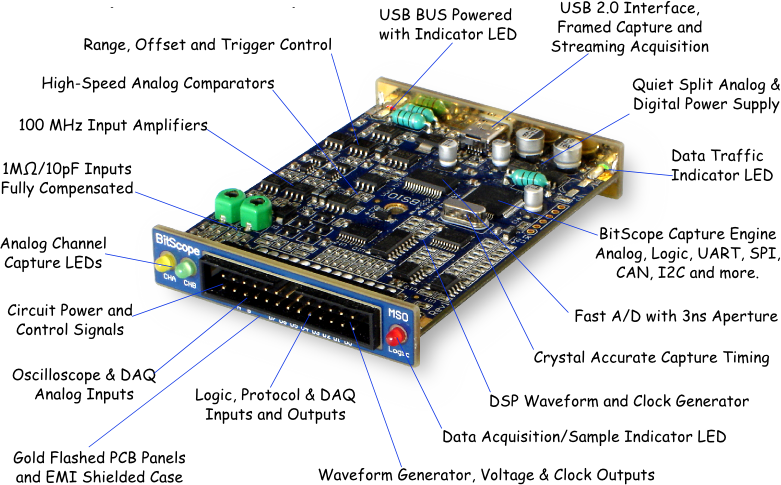 All models include BitScope DSO for analog and mixed signal work and BitScope Logic for digital. 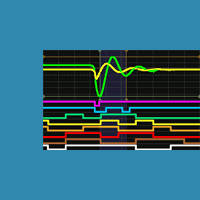 There is a growing range of other software applications available for specific purposes including BitScope Meter for fast and automated waveform measurement and BitScope Chart for multi-channel data acquisition and chart recording. BitScopes are fully user programmable so they can be used in highly customized applications or even integrated into third party products and software systems on OEM. They may be programmed directly at the virtual machine level using publish user guides or via the BitScope Library which makes available all BitScope's mixed signal data acquisition and generation functions via an easy to use function call API. Visit the Software, Products and Design pages to learn more about BitScope. Be sure to check BitScope News for the latest releases. You can buy BitScope and grab free downloads online. Feel free to contact us any time with questions or for quotes and dealer locations. We also recommend you browse our extensive online support pages for the latest information about using BitScope, updates and solving problems. Raspberry Pi and BitScope work well together to build reliable industrial strength physical computing platforms for test, measurement and data acquisition. Our software works very well on Raspberry Pi but the Raspberry Pi offers a lot more than this for BitScope based test and measurement. 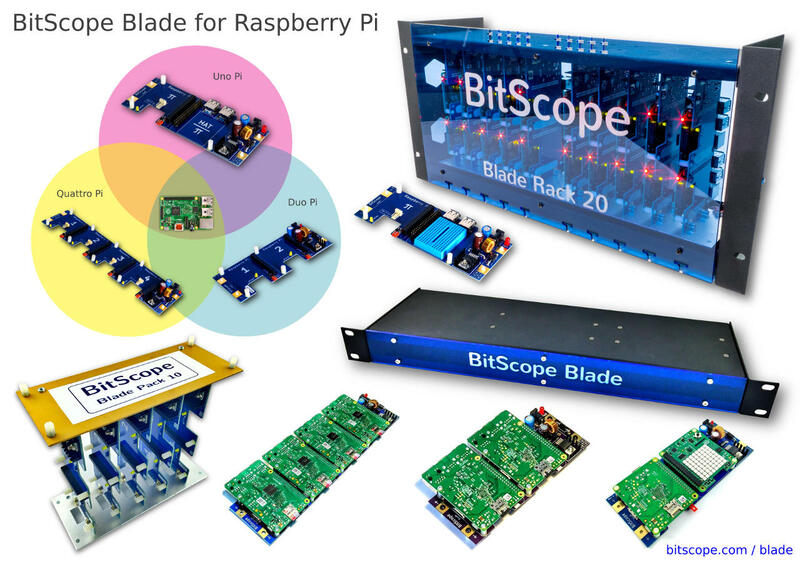 Comprehensive industrial quality and scalable solutions can be built with Raspberry Pi using BitScope Blade. This includes flexible multi-channel test & measurement systems using BitScope Micro and Uno Pi up to cluster computing solutions for some serious data processing built with Duo Pi or Quattro Pi mounted in Blade Racks. Blades work with other solutions too, such as Sense HAT and the new Raspberry Pi 3 offers built-in WiFi and Bluetooth and quad-core 64 bit processing as standard. It doesn't end with test & measurement. BitScope Blade is also well suited for stand-alone servers and workstations, cluster computing and cloud hosting infrastructure, remote sensing, general physical computing and in education. Of course, like BitScope itself, Raspberry Pi is user programmable and a huge range of software solutions are available for it via several different operating sysems published on the Raspberry Pi website or customised solutions which are available from BitScope. Connected BitScopes may be programmed directly via Raspberry Pi so all of BitScope's mixed signal data acquisition and generation functions are directly available to Raspberry Pi. The BitScope Library is compatible with all Raspberry Pi models and may be used with other functions provided by the Raspberry Pi or connected HAT devices from third parties.